The following tet is part of the Plastics Update Issue 4 from the negotiations in Nairobi. 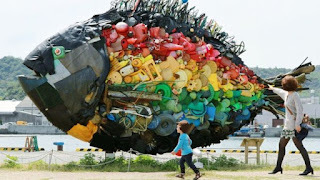 The United Nations Environment Assembly (UNEA) and several global environmental agreements have taken an interest in plastic pollution, recognising it as a serious and rapidly growing issue of global concern which requires an urgent and global response. Following the UNEA3 meeting in December 2017, UN Environment formed an Ad Hoc Open Ended Expert Group (AHOEEG) to present options to combat marine plastic litter and microplastics for global consideration of member states, experts, and civil society. Several representatives of the #BreakFreeFromPlastic movement are in attendance for the first of two AHOEEG meetings in support of a joint call for an international legally binding agreement on plastics and plastic pollution. Referred to as “Option 3” in the content analyzed in this meeting, this position, endorsed by 6 of the 9 Major Groups and co-signed by many NGOs worldwide, calls for any such convention to include certain features including a binding global reduction target, caps on production and consumption of plastics, and requirements for loss prevention, collection, and recycling of all plastics. At the conclusion of UNEA3 in December 2017, over 200 member states adopted a resolution establishing a process for ongoing coordinated international action to combat the marine litter and microplastics crisis plaguing the world’s marine and land environments. The resolution created an Ad Hoc Open-Ended Expert Group (AHOEEG), tasked with examining options for combating marine plastic litter and microplastics from all sources, including through global legally binding mechanisms. Since December, a number of background papers have been prepared to establish the scope of the AHOEEG and to inform its ongoing work. The first of the two AHOEEG meetings is being held this week in Nairobi. The second will be held in November - the dates and location to be finalized during this first meeting. Feasibility and effectiveness of those response options. “Maintaining the status quo,” is not a viable option as it will not solve the plastic pollution crisis. These BFFP member groups have joined with 6 of the 9 Major Groups to endorse the pursuit of Option 3, calling for a set of strong enforcement mechanisms to ensure governments and industries comply with global targets for reduction and production and consumption.